Philadelphia MOVE Bombing Still Haunts Survivors Twenty years ago, Philadelphia's Osage Avenue was the site of a stunning use of force by city police. Survivors recall the day that a confrontation between police and a radical group called MOVE left 11 people dead. Five were children. 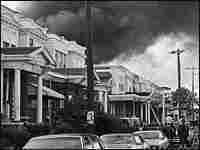 Smoke billows over homes on Osage Avenue after police bombed the MOVE home, May 13, 1985. The city rebuilt the 61 homes that were destroyed; the new homes have cracked foundations and have been deemed uninhabitable, resulting in an ongoing court battle. The MOVE bombing devastated the city of Philadelphia. But for one father, Andino Ward, it returned to him his long-lost son, the sole child to survive the bombing of the MOVE house. For years, father and son guarded their privacy, but Ward agreed to talk to NPR's Laura Sullivan. 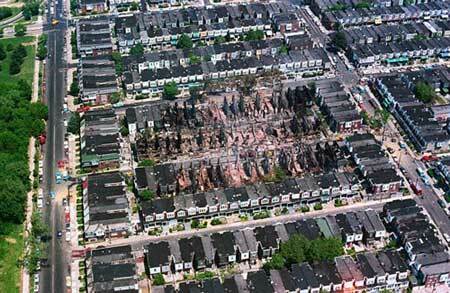 An aerial view of Philadelphia's Osage Avenue after the move bombing, May 18, 1985. Twenty years ago, Philadelphia's Osage Avenue was the site of a stunning use of force by city police. After a long standoff, police dropped a bomb on the headquarters of a radical group called MOVE, sparking a fire that gutted a neighborhood and left 11 people dead. Five were children. MOVE was a radical cult-like group that preached revolution, advocating a return to nature and a society without government, police or technology. The group took up residence on Osage Avenue, a quiet tree-lined street of tidy row houses. Except for the MOVE house. The windows and doors of 6221 Osage Ave. were barricaded with plywood. The group hoarded weapons, built a giant wooden bunker on the roof and used a bullhorn to scream obscenities all hours of the night. Frustrated neighbors turned to city officials for help. 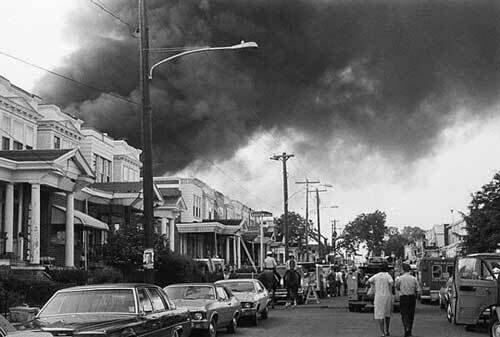 On the morning of May 13, 1985, dozens of Philadelphia police, fire fighters and city officials amassed around the MOVE house to force the group out. A standoff ensued, as MOVE members bunkered down inside the house exchanged gunfire with police outside. At 5:30 that evening, a Philadelphia police helicopter dropped a bomb onto the roof of the house in an effort to drive MOVE members out. Accounts differ on why the fire wasn't snuffed out, despite the dozen fire trucks surrounding the block. Ramona Africa, the sole surviving adult in the house, says police fired on MOVE members as they tried to escape the burning house. Police say the MOVE members ran in and out of the house firing at them. Police ordered their officers and fire fighters to stay back. What is clear is that four hours later, 61 houses on the block were gone, and everyone inside the MOVE house, except for Ramona Africa and a 13-year-old boy, was dead. Reporter Laura Sullivan talks to survivors of that day -- MOVE members, Osage Avenue residents and the city officials, firefighters and police who continue to be haunted by the tragedy.